I like to walk through the streets in the historic centre of Lecce very much. I usually pass there to take a look at houses for rent for the holidays or welcoming structures such as B&Bs and holiday homes belonging to my clients and real estate partners. And I realise always more that strolling through these streets my whole history passes by me. A history deeply rooted long before the Romans (of which a theatre and an amphitheatre still remain). The Castle of Lecce, known as the Carlo V Castle from the name of the Emperor Charles V of Hapsburg, still remains in all its magnificence from the XVI century. 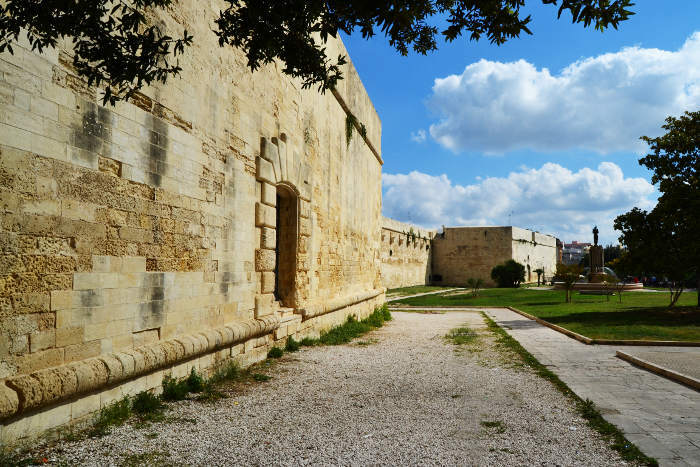 It was he who wanted the construction of a military fortress that now lies in the very centre of Lecce near the Sant’Oronzo Square. It is a huge building (for the Lecce canons), square in shape and with four turrets at the four corners. You enter from the Porta Reale (Royal Door) that gives access to the internal court of the Castle. In the past the building had military functions, it even had a moat all along its perimeter (now the moat doesn’t exist any more) and you can still see the placements where the pieces of artillery were. 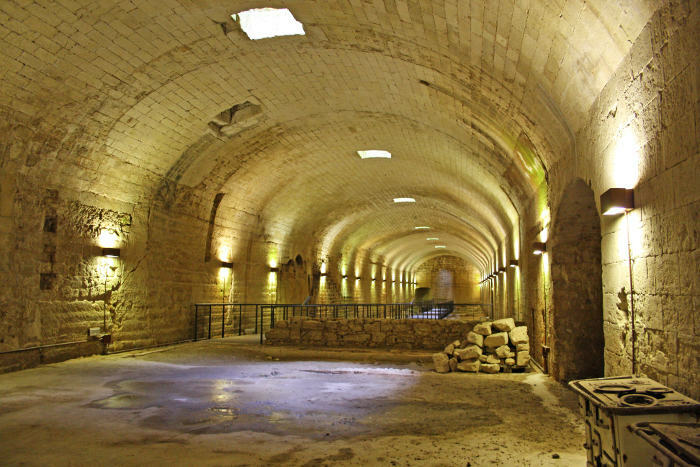 Then from 1870 to 1979 it became a barrack until the Military Administration gave it over to the Municipality of Lecce. Today it is a place you can visit and in which art exhibitions, meetings and cultural initiatives are held. Inside the Castle you can visit the Papier Mâché Museum that, in my opinion, is the most characteristic form of art in Lecce and in Salento. Not by chance if you go round the streets of the historic centre of Lecce you will find some small artisan papier mâché laboratories now and then. 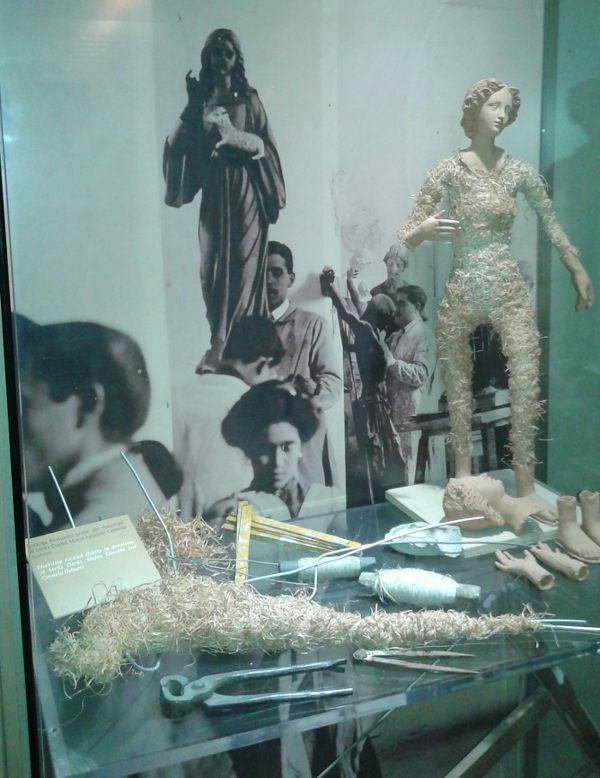 It is the maufacturing of paper and rags wet with vynilic glue (once they used to use a glue made with flour) to create shapes that are generally statues from the religious world or from every day life. 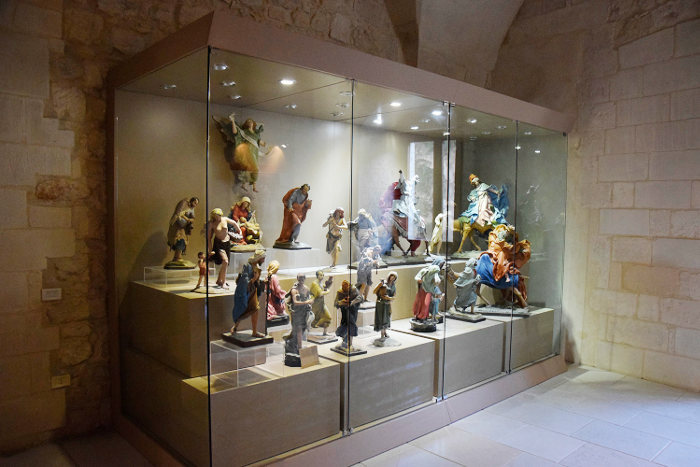 In this museum you can get an idea of this ancient art of Salento. They are galleries that have been brought to light from under the moat. Today you can only visit the south gallery that connects the San Giacomo turret to the turret of the Trinità while the east gallery is only partly visible and is still waiting to be freed from the filling material. As I said before, the Castle is used today for cultural events and temporary exhibitions. But there are also two halls dedicated to a permanent exhibition that proposes the G.Faliva – E.Pignatelli Donation. The works are exposed on the first floor. I will finish with some anecdotes about the Castle that I discovered on the internet. 3) You can see the Imperial Hapsburg coat of arms above the entrance door to highlight the fact that this architectural work was wanted and made by the Hapsburgs. The ticket costs 3€ and a reduced ticket costs 2€. For children and shool classes the cost is of 1€. Disabled people and their accompanying person enter for free. Available services: reception for groups, bar – restoration point, ticket office, merchandising, recreational offers, congress hall, hygenic services, shop with artisanal products, guided visits. Considering that this last information about prices and services could change, I invite you to visit the Carlo V Castle web site directly where you will be able to see the opening times and ask for direct information. More information on iLecce.it that I thank for having given me the photos on this post as well.